Inflammation of the central nervous system is an important but poorly understood part of neurological disease. After acute brain injury or infection there is a complex inflammatory response that involves activation of microglia and astrocytes and increased production of cytokines, chemokines, acute phase proteins, and complement factors. Antibodies and T lymphocytes may be involved in the response as well. In neurodegenerative disease, where injury is more subtle but consistent, the inflammatory response is continuous. The purpose of this prolonged response is unclear, but it is likely that some of its components are beneficial and others are harmful. Animal models of neurological disease can be used to dissect the specific role of individual mediators of the inflammatory response and assess their potential benefit. To illustrate this approach, we discuss how mutant mice expressing different levels of the cytokine transforming growth factor β-1 (TGF-β1), a major modulator of inflammation, produce important neuroinflammatory phenotypes. We then demonstrate how crosses of TGF-β1 mutant mice with mouse models of Alzheimer's disease (AD) produced important new information on the role of inflammation in AD and on the expression of different neuropathological phenotypes that characterize this disease. TGF-β1 was initially described for its ability to transform normal rat kidney cells . Since then, it has been shown to also promote cell survival or induce apoptosis, stimulate cell proliferation or induce differentiation, and initiate or resolve inflammation. Its differential effects depend on the cell type involved, the cell's environment, and the duration and amount of TGF-β1 production. TGF-β receptors are found on most cell types and their activation affects the expression of a few hundred genes [2–4]. The molecular aspects of TGF-β signalling are extensively studied and we refer to several excellent reviews [2, 3]. In the normal CNS, all three TGF-β isoforms and their receptors are expressed within neurons, astrocytes, and microglia, and TGF-β1 can modulate cellular responses in these cells as well as in vascular and meningeal cells [5, 6]. TGF-β1 is the most abundant and best studied TGF-β isoform and an important component of the brain's response to injury. It is consistently increased after various forms of brain insults and in neurodegenerative diseases (Table 1). Still, we understand very little about the purpose and consequences of increased TGF-β1 expression to brain function. TGF-β1 is elevated acutely after injury to the brain and chronically in neurodegenerative disease. To study the role of TGF-β1 in the CNS we overproduced bioactive peptide under the control of glial fibrillary acidic protein (GFAP) regulatory sequences in astrocytes of two independent lines of transgenic mice (herein called TGF-β1 mice) . We also analyzed brains of mice that are TGF-β1 deficient or knockout . C57BL/6 mice lacking TGF-β1 have defects in vasculogenesis and angiogenesis leading to early embryonic lethality [9, 10], but mice on the NIH genetic background survive up to 3–4 weeks of age before they succumb to an autoimmune wasting syndrome . The effects of TGF-β1 expression and age on the expression of inflammatory phenotypes in these mice are graphically represented in what we call a "phenogram" (Figure 1). Phenograms of TGF-β1 and hAPP/TGF-β1 mice. 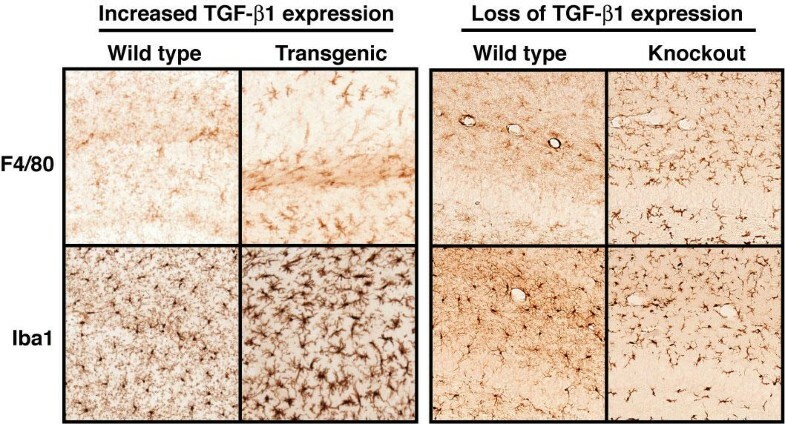 Underexpression and knockout of TGF-β1 results in neurodegeneration. Overexpression of TGF-β1 in astrocytes produces phenotypes that are altered by the addition of a transgene expressing mutant human amyloid. TGF-β1-induced astrogliosis and microgliosis aid in clearing amyloid, and TGF-β1-induced vascular fibrosis traps amyloid in blood vessel walls, producing amyloid angiopathy. Hydrocephalus and brain fibrosis are common sequelae after whole brain inflammation due to bacterial meningitis, subarachnoid hemorrhage, or severe traumatic brain injury. High CSF levels of TGF-β1 in patients with subarachnoid hemorrhage confer an increased risk of developing chronic hydrocephalus [12, 13]. TGF-β1 injected into the lateral ventricles produces hydrocephalus in mice . TGF-β1 mice with high levels of expression in astrocytes had persistent communicating hydrocephalus at birth, enlargement of cerebral hemispheres, and thinning of the overlying cerebral cortex [7, 15]. Additional stimulation of the injury-responsive GFAP-TGF-β1 transgene in adult low-expressor mice by CNS stab lesions leads to the development of mild hydrocephalus. These results indicate that hydrocephalus is directly related to TGF-β1 expression and not due to other developmental abnormalities . Histological analysis shows decreased stratification of neuronal cell layers and leukomalacia-like areas. Given the extensive fibrosis of the meninges in TGF-β1 mice hydrocephalus may be a result of decreased CSF outflow through fibrotic arachnoid villi. Indeed, TGF-β1 plays a key role in fibrosis in the lung [16, 17] and the kidney . It induces the production of a large number of extracellular matrix proteins, proteases and their inhibitors [7, 19] and it may be the excess production of extracellular matrix proteins by TGF-β1 that results in hydrocephalus. The amount of TGF-β1 produced in response to injury may vary among individuals and be determined by genetic polymorphisms in the TGFB1 gene. Polymorphisms that lead to higher levels of TGF-β1 production in various assays were associated with increased risk of fibrosis in transplant recipients  and accelerated decline in lung function in patients with cystic fibrosis . Studies in TGF-β1 knockout mice demonstrated an essential role for TGF-β1 in vasculogenesis and angiogenesis during development  and other studies implicated TGF-β1 also in maintaining vascular integrity in adults [22, 23]. Two TGF-β receptors on endothelial cells, endoglin and ALK1, mediate at least part of this effect and mutations in these receptors cause genetic disorders of the vasculature [24–26]. While low levels of TGF-β1 are necessary for endothelial cell proliferation and angiogenesis, higher levels result in increased synthesis of basement membrane proteins and differentiation [27–29]. Our results in TGF-β1 overexpressing mice are consistent with these findings and implicate chronically elevated TGF-β1 levels directly in cerebrovascular fibrosis. TGF-β1 mice demonstrated an age- and dose-dependent formation of thioflavin S-positive perivascular amyloid deposits and degeneration of vascular cells . The amyloid deposits had an appearance similar to those found in brains of AD cases with concomitant cerebral amyloid angiopathy (CAA). 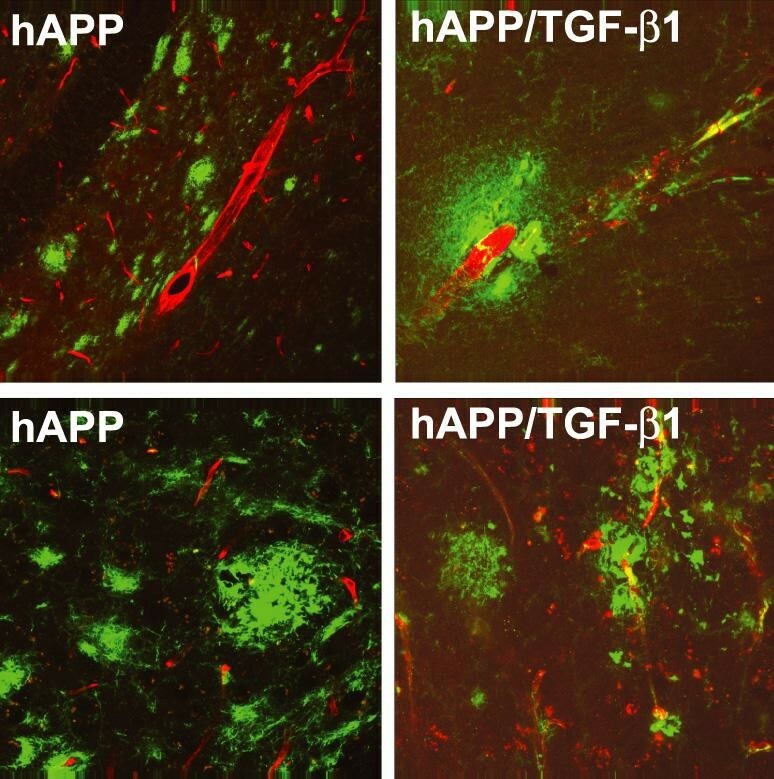 However, Aβ, the proteolytic fragment of human amyloid precursor protein (hAPP) that accumulates in AD, was at best a minor component of the deposits in TGF-β1 mice. Analysis of the progression of the cerebrovascular changes in these mice showed a significant accumulation of basement membrane proteins perlecan and fibronectin in microvessels of 3–4-month-old TGF-β1 mice. This change in the vasculature preceded the formation of thioflavin S positive amyloid and was accompanied by a thickening of the cortical capillary basement membranes . Vascular fibrosis occurs in hypertension, in which TGF-β1 is elevated in serum of patients , as well as in AD and vascular dementia, both of which also are associated with increases in TGF-β1 (Table 1). We envision a scenario where TGF-β1 induces extensive production and accumulation of extracellular matrix proteins in the vascular wall resulting in the formation of β-pleated sheets, typically referred to as amyloid. The deposition of amyloid in cerebral blood vessel walls is the cause of CAA. It is a common vascular abnormality in AD, where the amyloid contains large amounts of Aβ, but it can occur in the nondemented elderly as well [32, 33]. CAA is a major cause of normotensive intracerebral haemorrhage . It is also characterized by degeneration of cerebrovascular cell and thickening of the vascular basement membrane [35–38]. Activation of astrocytes or astrogliosis is a prominent component of the inflammatory response and an indicator of injury in the brain. These astrocytes produce a large array of inflammatory mediators, growth and neuroprotective factors, and they are involved in phagocytosis [39–41]. Again, while some of these effects are clearly beneficial, extensive astrogliosis may be detrimental and can result in the formation of "glial scars" that prevent axonal sprouting . In TGF-β1 homozygous mice, GFAP and TGF-β1 immunoreactivities were strongly elevated around cerebral blood vessels, and activated astrocytes showed a characteristic perivascular arrangement, a pattern often observed in chronic hydrocephalus in humans and other animals . TGF-β1 mice with moderate or low levels of TGF-β1 overexpression had a less pronounced astrogliosis but GFAP expression was consistently increased . Indeed, TGF-β1 directly increases GFAP transcription in cultured astrocytes . Activated microglia are also a typical part of the brain's inflammatory response. Although TGF-β1 is generally considered an anti-inflammatory cytokine, it has been associated with recruitment of monocytes to the site of injury at the beginning of the immune response . Similarly, TGF-β1 has been implicated in the activation and recruitment of microglia and monocytes in HIV encephalitis . Local expression of TGF-β1 in astrocytes also renders transgenic mice more susceptible to experimental autoimmune encephalomyelitis (EAE) , a rodent model of multiple sclerosis. When challenged with spinal cord homogenate, TGF-β1 mice show increased infiltration of monocyte/macrophage cells and increased expression of major histocompatibility complex (MHC) class II proteins. These mice also develop a more severe clinical phenotype and earlier onset of disease than nontransgenic littermate controls . TGF-β1 has also been shown to induce expression of the proinflammatory cytokines tumor necrosis factor (TNF)-α and IL-1β when added to brain vascular endothelial cells . Finally, TGF-β1 mice demonstrate an age-related microgliosis that is most prominent in the hippocampus (Figure 2). Preliminary studies suggest that this microgliosis is associated with reduced neurogenesis (Buckwalter and Wyss-Coray unpublished data). Microgliosis results from both increased and decreased levels of TGF-β1. 30-month-old TGF-β1 mice (left panel) demonstrate increased staining for F4/80, a microglial marker, in the hippocampus. A stain for Iba1, which is present in all microglia and monocytes, reveals that microglia in TGF-β1 mice are more numerous and have more cytoplasm and shorter processes than microglia in an age-matched littermates. TGF-β1 knockout mice (right panel) demonstrate dramatically increased staining with F4/80 in all brain regions and Iba1staining reveals an activated microglial morphology that is less dramatic than that seen with TGF-β1 overexpression. Consistent with TGF-β1's anti-inflammatory role, knockout mice showed a striking microgliosis in the neocortex and hippocampus at P1 and even more so at P21 (Figure 2). Interestingly, no concomitant increase in astrocyte activation was observed in TGF-β1 knockout mice . As mentioned above, overexpression of TGF-β1 using adenovirus led to decreased production of the inflammatory chemokines MCP-1 and Mip-1α after transient cerebral ischemia . These effects of TGF-β1 on the recruitment and activation of microglial cells and inflammatory responses in the CNS in general may be of importance not only for classical immune-mediated CNS diseases such as MS and HIV encephalitis, but also for other CNS diseases with an involvement of microglia and inflammatory responses, notably AD (see below). TGF-β1 has been demonstrated to protect neurons against various toxins and injurious agents in cell culture and in vivo (reviewed in [5, 50]). For example, intracarotid infusion of TGF-β1 in rabbits reduces cerebral infarct size when given at the time of ischemia . Rat studies also showed that TGF-β1 protects hippocampal neurons from death when given intrahippocampally or intraventricularly one hour prior to transient global ischemia . Mice infected with adenovirus that overexpressed TGF-β1 five days prior to transient ischemia also had smaller infarctions than control animals . Astroglial overexpression of TGF-β1 in transgenic mice protects against neurodegeneration induced with the acute neurotoxin kainic acid or associated with chronic lack of apolipoprotein E expression . Boche and coworkers also demonstrated that TGF-β1 protects neurons from excitotoxic death . In contrast, TGF-β1 knockout mice display signs of spontaneous neuronal death, with prominent clusters of TUNEL-positive cells in different parts of the brain including the neocortex, caudate putamen and cerebellum . Besides the increase in TUNEL-positive neurons, unmanipulated 3-week-old TGF-β1 knockout mice also have significantly fewer synaptophysin positive synapses in the neocortex and hippocampus compared to wildtype littermate controls, and increased susceptibility to kainic acid-induced neurotoxicity. It is not clear how TGF-β1 protects neurons, but several mechanisms have been postulated. For example, TGF-β1 decreases Bad, a pro-apoptotic member of the Bcl-2 family, and contributes to the phosphorylation, and thus inactivation, of Bad by activation of the Erk/MAP kinase pathway . On the other hand, TGF-β1 increases production of the anti-apoptotic protein Bcl-2 . TGF-β1 has also been shown to synergize with neurotrophins and/or be necessary for at least some of the effects of a number of important growth factors for neurons, including neurotrophins, fibroblast growth factor-2, and glial cell-line derived neurotrophic factor (reviewed in [50, 56]). In addition, TGF-β1 increases laminin expression  and is necessary for normal laminin protein levels in the brain . Laminin is thought to provide critical support for neuronal differentiation and survival and may be important for learning and memory [57, 58]. It is also possible that TGF-β1 decreases inflammation in the infarction area, attenuating secondary neuronal damage . In addition to its effects on neuronal maintenance and survival, TGF-βs and the TGF-β signalling pathway have recently been implicated in the regulation of synaptic growth and function (reviewed in ). Synaptic overgrowth is caused by abnormal TGF-β signalling in Drosophila with mutations in genes encoding for the late endosomal gene spinster whereas the inhibitory Smad protein Dad, and mutations in TGF-β receptors can prevent this phenotype . TGF-β receptors and dSmad2 are also required for neuronal remodelling in the Drosophila brain . In Aplysia, sensory neurons express a type II TGF-β receptor and recombinant human TGF-β1 induces phosphorylation and redistribution of the presynaptic protein synapsin and modulates synaptic function [62, 63]. Thus, TGF-β signals may be important in modulating synaptic strength and numbers in mammals as well. Neuroinflammation is a prominent characteristic of neurodegenerative diseases like AD and is likely to encompass beneficial and detrimental effects . Thus, inflammatory processes may attempt to clear dying cells or aggregated proteins, initiate repair processes, but also contribute to cell death and degeneration. The neuroinflammatory profile of AD as observed by a neuropathologist does not allow him to draw conclusions about mechanisms, sequence of action, or cause and effect of any of the mediators involved. Therefore, inflammatory processes in the AD brain need to be studied in appropriate model systems in order to understand their roles in the disease process. AD is characterized clinically by an age-dependent progressive cognitive decline and pathologically by the presence of protein deposits in the form of amyloid plaques and cerebrovascular Aβ deposits in the extracellular space. In addition, abnormal phosphorylation of the microtubule associated protein tau results in the formation of tangles inside neurons . These protein deposits are associated with prominent neurodegeneration and neuroinflammation. There is strong evidence that abnormal production or accumulation of Aβ is a key factor in the pathogenesis of AD (reviewed in ) but many cofactors are likely to modulate Aβ toxicity. Transgenic mouse models overproducing familial AD-mutant hAPP reproduce important aspects of AD, including amyloid plaques, neurodegeneration, neuroinflammation, and cognitive deficits (for example [66–68]). Specific inflammatory mediators can be studied in these AD models by crossing them with mice lacking or overproducing selected inflammatory mediators. The phenogram of TGF-β1 mutant mice (Figure 1) illustrates and underlines the prominent effects this cytokine has on inflammatory processes in the brain. Altering TGF-β1 levels could therefore be expected to have prominent effects on the neuroinflammatory profile of AD. Overexpression of TGF-β1 in hAPP mice resulted in a dramatic shift in the site of Aβ accumulation (Figure 3). While Aβ accumulates almost exclusively in parenchymal plaques in hAPP mice, most of the Aβ is associated with vascular structures in hAPP/TGF-β1 bigenic mice at 12–15 months of age. These vascular deposits in bigenic mice are already detectable at 2–3 months of age with human Aβ specific antibodies, whereas age-matched singly transgenic hAPP or TGF-β1 control mice have no such deposits . This mechanism of vascular amyloid formation may be relevant for humans as well. Cortical TGF-β1 mRNA levels correlate positively with the degree of cerebrovascular amyloid deposition in AD patients, and analysis of mildly fixed cortical tissues showed that TGF-β1 immunoreactivity was elevated along cerebral blood vessels and in perivascular astrocytes [69, 70]. An increase in TGF-β1 may be triggered in response to traumatic brain injury or other forms of neuronal and cellular injury. Interestingly, brain injury is considered a major environmental risk factor for AD , and in traumatic brain injury, blood-derived TGF-β1 stored in platelets is likely released in large amounts at the lesion site . In addition, individuals with a predisposition to higher TGF-β1 production, particularly in response to injury, may be more susceptible to vascular variants of AD. TGF-β1 overexpression in hAPP mice leads to CAA and reduces total brain amyloid. hAPP mice demonstrate amyloid plaques that are predominantly parenchymal (left panels), while bigenic hAPP/TGF-β1 mice (right panels) display fewer parenchymal amyloid plaques and have Aβ deposits localized to blood vessel walls (Aβ, green; Glut-1, red). How does TGF-β1 cause such a dramatic change in the site of Aβ deposition? As alluded to above, TGF-β1 induces the production of many extracellular matrix proteins in the vascular basement membrane. Proteins including laminin, fibronectin, and heparan sulfate proteoglycans (HSPG) such as perlecan, have been implicated in amyloidosis (reviewed in [72, 73]. In particular, glucosaminoglycan side chains of HSPGs can precipitate Aβ injected into the brain . It is therefore likely that TGF-β1-induced basement membrane accumulation and fibrosis precipitates the accumulation of Aβ. In several different cell culture systems, TGF-β1 can also directly induce the expression of the APP gene [75–77]. There is currently one drug, made by Neurochem (Montreal, Quebec, Canada), which has completed phase clinical II trials that reduces amyloid deposition in transgenic mouse models by interfering with the interaction between Aβ and glucosaminoglycans. Besides the accumulation of Aβ in the vasculature, bigenic hAPP/TGF-β1 mice have a 75% reduction in parenchymal amyloid plaques and overall levels of Aβ are 60–70% lower than in singly transgenic hAPP littermate controls . Similar to singly-transgenic TGF-β1 mice, increased astroglial TGF-β1 production in aged bigenic mice causes extensive microglial and astroglial activation in the hippocampus and cortex . Both cell types are phagocytic and we demonstrated that activation of cultured microglia with TGF-β1 results in increased degradation of Aβ . In addition, primary adult astrocytes phagocytose Aβ bound to plastic or in brain sections from hAPP mice . Thus, while fibrosis due to overexpression of TGF-β1 probably directs the deposition of Aβ to vascular walls, TGF-β1-activated microglia and/or astrocytes can degrade Aβ and lower brain concentration of Aβ overall (Figure 3). In AD patients, Aβ accumulation in parenchymal plaques seems to correlate inversely with Aβ in cerebral blood vessels [69, 78, 79] and it is tempting to speculate that TGF-β1 is involved in this process. Given the large number of studies demonstrating that TGF-β1 is neuroprotective, it is reasonable to assume that one of the roles of TGF-β1 is to keep neurons alive in the brains of patients with Alzheimer's Disease. Indeed, expression of TGF-β1 in the superior temporal gyrus of AD brains correlates inversely with neurofibrillary tangle counts but is increased only in the late stages of disease . hAPP/TGF-β1 mice have fewer dystrophic neurites than hAPP controls but this is likely confounded by the decrease in amyloid deposition in these mice . Notably, TGF-β1 overproduction results not only in an overall decrease in Aβ accumulation in hAPP/TGF-β1 brains but also in a relative decrease in Aβ1–42 out of the total Aβ pool. The relative amount of Aβ1–42 appears to be a good measure for the relative toxicity and propensity of Aβ to aggregate. Chronic TGF-β1 production is likely to have different effects than acutely induced TGF-β1 and this could also have detrimental effects on neuronal survival. For example, vascular fibrosis could cause ischemia and make areas with high TGF-β1 levels more susceptible to neuronal death. Interestingly, old TGF-β1 mice have decreased blood flow to the hippocampus that correlates inversely with the thioflavin-S positive vascular deposits in this region . Better tools will be necessary to separate direct neuroprotective from indirect effects of TGF-β1 in vivo. Neuroinflammation occurs consistently in neurological diseases but its role is unclear. We demonstrate here that the analysis of inflammatory phenotypes in TGF-β1 mice has been helpful in understanding human disease. First, highly elevated cerebral TGF-β1 production is clearly associated with hydrocephalus in mice and humans. Interfering with local production of TGF-β1 may therefore be of potential therapeutic value in the management of hydrocephalus. Second, studying chronic overproduction of TGF-β1 in a mouse model for AD revealed that TGF-β1 has a key role in the development of CAA and also reduces amyloid deposition in the parenchyma. This highlights the utility of such models in dissecting opposing effects of inflammatory mediators in neurological diseases. Therapeutic approaches blocking the effect of TGF-β1 on the vasculature or promoting TGF-β1's effect in the brain parenchyma can be pursued based on these results. In fact, a drug that interferes with the accumulation of Aβ in the basement membrane has now completed phase II clinical trials. Despite the progress made in understanding the role of TGF-β1 and many other factors in inflammation, many questions remain. Animal models such as Drosophila might be useful to study simple aspects of inflammation such as phagocytosis, but more complex inflammatory pathways are absent in flies and need to be studied in mammals. Drosophila could also be used to study the direct effects of cytokines on neurons and glial cells . New genomic and proteomic approaches will be helpful in expanding our understanding of neuroinflammation in animal models to more complex levels. This will also require mathematical modelling systems as well as powerful database tools. Importantly, the inflammatory phenotypes generated in animal models need to be linked to functional outcome measures because these are the only measures that matter for a patient with neurological disease. This work was supported by the National Institutes of Health grant AG20603 and the Veterans Administration GRECC.